The Shawnee 8th grade girls basketball team was recognized for being SWBL Tournament champs during the Preble Shawnee Board of Education meeting on Thursday, March 14. 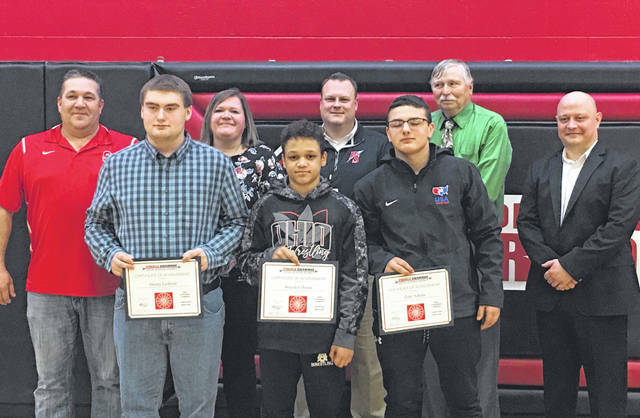 The following students were recognized for being SWBL Wrestling Tournament champs during the Preble Shawnee Board of Education meeting on Thursday, March 14: Zane Adams, Brayden Doran, and Donny Ledford. The following students were recognized for achievements during the Preble Shawnee Board of Education meeting on Thursday, March 14: Jenna Lovely (First Team SWBL and First Team All Southwest District DIII), Bryce Singleton (First Team SWBL and Honorable Mention All Southwest District DIII), Ty Stevenson (State Tournament 7th Place), Brenna Woodard (First Team SWBL), and Jedd Gelsen (New school record for 82 blocked shots). During the Preble Shawnee Board of Education meeting on Thursday, March 14, the Arrows’ 7th grade boys basketball team was recognized for its undefeated season and being SWBL Tournament champs. 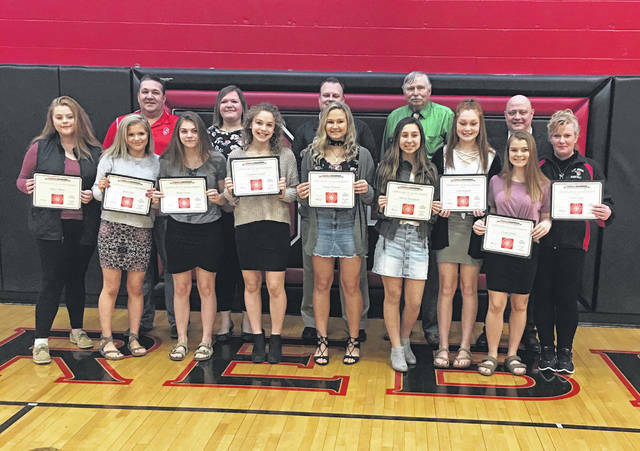 https://www.registerherald.com/wp-content/uploads/sites/41/2019/03/web1_image3-1-.jpegThe Shawnee 8th grade girls basketball team was recognized for being SWBL Tournament champs during the Preble Shawnee Board of Education meeting on Thursday, March 14.
https://www.registerherald.com/wp-content/uploads/sites/41/2019/03/web1_image4.jpegThe following students were recognized for being SWBL Wrestling Tournament champs during the Preble Shawnee Board of Education meeting on Thursday, March 14: Zane Adams, Brayden Doran, and Donny Ledford. 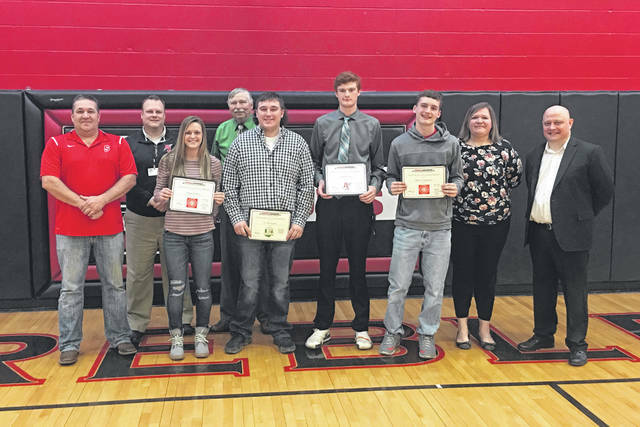 https://www.registerherald.com/wp-content/uploads/sites/41/2019/03/web1_image5.jpegThe following students were recognized for achievements during the Preble Shawnee Board of Education meeting on Thursday, March 14: Jenna Lovely (First Team SWBL and First Team All Southwest District DIII), Bryce Singleton (First Team SWBL and Honorable Mention All Southwest District DIII), Ty Stevenson (State Tournament 7th Place), Brenna Woodard (First Team SWBL), and Jedd Gelsen (New school record for 82 blocked shots). 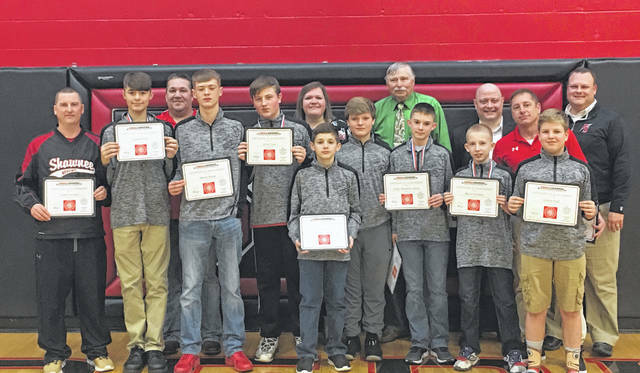 https://www.registerherald.com/wp-content/uploads/sites/41/2019/03/web1_image2-1-.jpegDuring the Preble Shawnee Board of Education meeting on Thursday, March 14, the Arrows’ 7th grade boys basketball team was recognized for its undefeated season and being SWBL Tournament champs.